The optimism among Democrats heading into the 2018 midterms is evidenced in part by the strong candidate recruitment the party was able to achieve – and its ability to recruit candidates in nearly all 435 U.S. House districts. In total, there will be no Democratic candidates on the November ballot in just three districts, compared to 38 for the Republicans. Richard Winger of the invaluable Ballot Access News reported last month that the 432 candidates fielded by the Democrats across the 50 states is the most by any party since 1974, when Democrats ran nominees in all but one district. Both major parties landed candidates on the ballot in all November U.S. House races in 34 states: Alaska, Arkansas, Colorado, Connecticut, Delaware, Hawaii, Idaho, Illinois, Indiana, Iowa, Kansas, Kentucky, Maine, Maryland, Minnesota, Missouri, Montana, Nebraska, Nevada, New Hampshire, New Jersey, New Mexico, North Dakota, Ohio, Oklahoma, Oregon, Rhode Island, South Carolina, South Dakota, Tennessee, Utah, Vermont, West Virginia, and Wyoming. That tally is up from 28 states in 2016 and 31 states in 2014. Voters in 41 districts across the remaining 16 states will have the choice of only one major party candidate, or nearly one in 10 contests (9.4 percent). [This tally includes nine seats in California and two in Washington – states with nonpartisan blanket primary laws that moved the top two finishers, regardless of party, to the general election]. But while parties in more than a dozen states failed to fill out the November ballot, the 2018 cycle also continues decades of continuous major party choices in congressional contests in several states across the country. 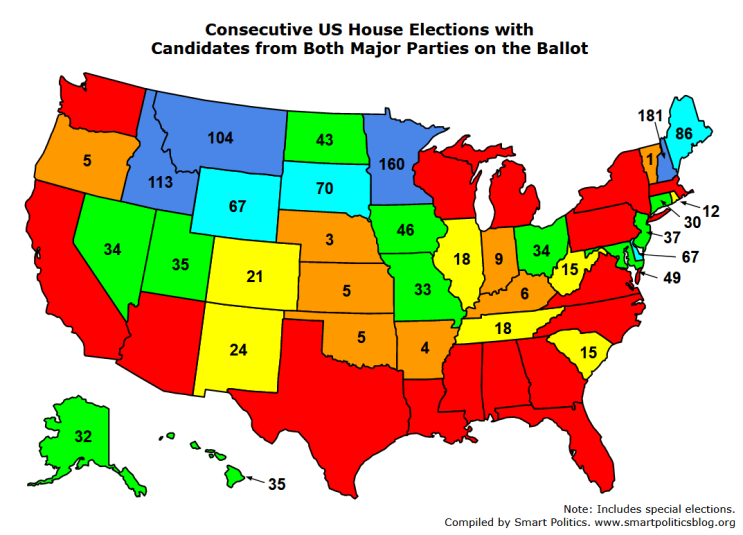 A Smart Politics review of congressional election data finds that New Hampshire (181), Minnesota (160), Idaho (113), and Montana (104) lead the nation with 100+ consecutive U.S. House contests with both Democratic and Republican candidates on the ballot, with streaks in New Hampshire, Montana, Delaware, and Wyoming dating all the way back to the 1800s. With a full slate of major party nominees in its two congressional districts this cycle, New Hampshire has fielded Republicans and Democrats in 181 consecutive U.S. House contests dating back to 1856 – the first cycle in which Republicans ran nominees in Granite State U.S. House races. New Hampshire Democrats have continuously placed nominees on the ballot despite historically losing more than 80 percent of these elections over the decades. Continuing to close the gap on New Hampshire is Minnesota, which comes in second at 160 elections in a row. Gopher State voters have had the choice of candidates from both major parties in every U.S. House race for 20 straight cycles dating back to 1980. If the streaks continue for both states (barring reapportionment and special elections), Minnesota will overtake New Hampshire during the 2026 cycle when it reaches a streak of 192 in a row and New Hampshire reaches 189. The last candidate to run without major party opposition in Minnesota was DFLer Jim Oberstar in 1978 when he was challenged only by an American Party nominee to record his third of 18 victories from the state’s 8th CD. Minnesota’s streak is particularly notable due to its moderately large population (owning eight congressional districts since 1962); more districts means there are more opportunities for gerrymandering and extremely partisan districts where it is more difficult for the party out of power to recruit candidates. The Minnesota GOP has nonetheless continued to serve up nominees in the DFL-heavy 4th (St. Paul) and 5th (Minneapolis) CDs. 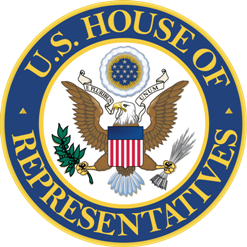 Of the 11 states with current streaks that date back prior to 2000, only Minnesota has sent delegations to the U.S. House with more than three seats. [The other 10 states are Alaska, Delaware, Hawaii, Idaho, Maine, Montana, New Hampshire, North Dakota, South Dakota, and Wyoming]. Two other states have fielded nominees from both major parties in more than 100 consecutive elections – Idaho and Montana. Idaho voters, though opting for the Republican candidate in 75+ percent of U.S. House contests since the streak began in 1902, have had Republican and Democratic nominees in each of the last 113 contests. Montana’s streak has now reached 104 consecutive elections. It has been 120 years since a major party failed to field a candidate in the Treasure State, when Republican and Silver Republican candidates squared off in the 1896 race for its at-large seat. Also extending its streak this cycle at #5 is Maine at 86 consecutive races with Democratic and Republican candidates in U.S. House contests dating all the way back to 1944. Maine Republicans continued to field candidates for a nine-cycle stretch in which they lost every race from 1996 to 2012 ending with Bruce Polquin’s victory in the open 2nd CD race in 2014. Rounding out the Top 10 are South Dakota at 70 in a row, Delaware and Wyoming (67 each), Maryland (49), and Iowa (46). After New Hampshire (1856) the longest streaks in the nation are held by Delaware (1888), Wyoming (1890), Montana (1898), Idaho (1902), South Dakota (1932), Maine (1944), North Dakota (1954), Alaska (1958), Minnesota (1980), and Hawaii (1990). Wyoming and Alaska (#18, 32 in a row) are the only two states that have fielded Democratic and Republican candidates in every U.S. House race since statehood. [New Hampshire’s statehood date preceded the formation of the GOP by several decades]. The 2018 cycle saw Michigan’s streak of 59 elections in a row dating back to 2010 come to an end. Republicans failed to run candidates challenging Democratic nominees in the 13th CD special and general elections to fill the seat of disgraced long-serving Representative John Conyers who resigned last December. Not surprisingly, each of the 41 seats with candidates from only one major party on the ballot in 2018 were blowouts during the 2016 cycle. Voters in 11 districts have now not had the option of candidates from both parties in each of the last two cycles with the GOP failing to field candidates in CA-34 (Jimmy Gomez), CA-40 (Lucille Roybal-Allard), CA-44 (Nanette Barragán), FL-24 (Frederica Wilson), LA-02 (Cedric Richmond), MA-01 (Richard Neal), MA-07 (open, Mike Capuano lost renomination), NY-08 (Hakeem Jeffries), NY-16 (Eliot Engel), NY-17 (Nita Lowey), and TX-20 (Joaquín Castro). [LA-02, NY-16, and TX-20 have not had a GOP candidate for the last three cycles and MA-01 and MA-07 for the last four]. Republicans also did not secure candidates on the November ballot this year in AL-07 (Terri Sewell), AZ-07 (Ruben Gallego) , CA-05 (Mike Thompson), CA-06 (Doris Matsui), CA-13 (Barbara Lee), CA-20 (Jimmy Panetta), CA-27 (Judy Chu), FL-10 (Val Demings), FL-14 (Kathy Castor), FL-20 (Alcee Hastings), FL-21 (Lois Frankel), GA-05 (John Lewis), MA-04 (Joe Kennedy), MA-08 (Stephen Lynch), MI-13 (open), MS-02 (Bennie Thompson), NY-05 (Gregory Meeks), NY-06 (Grace Meng), NY-07 (Nydia Velázquez), PA-18 (Mike Doyle, redistricted), TX-09 (Al Green), TX-28 (open), TX-30 (Eddie Bernice Johnson), VA-03 (Bobby Scott), WA-02 (Rick Larson), WA-09 (Adam Smith), and WI-02 (Mark Pocan). Democrats did not run candidates in California’s 8th CD (Paul Cook), Georgia’s 8th (Austin Scott), and North Carolina’s 3rd (Walter Jones). Next: Will Minnesota Democrats Take Back the State House? Be the first to comment on "Which States Have the Largest (and Longest) Streaks Fielding Candidates from Both Major Parties in US House Races?"